For his birthday dinner, Stephen really wanted to try Beef Wellington—he’d read about it somewhere and the curiosity had been burning for months. (Between his cholesterol issues and my dietary ones, it’s not exactly the kind of thing we dine on regularly.) So I did some research on Menupages (gotta love that find-a-food search, but why don’t they let you search all of Manhattan at once?) and found a place on Clinton Street called Salt Bar. It’s the same chef/owner as Salt in Greenwich Village, where I’ve eaten some really terrific meals, so I thought we were golden. Called up to make a res and was told they don’t take them for fewer than six people, but when I said it was my husband’s birthday eve the girl was sweet as can be: She took my name and told me she’d seat us right away. Great, I said, we’d be there between 7:30 and 8. We arrived at 7:45, only to find the joint packed and a sign on the sidewalk: Closed for private party, reopening at 8. I was kinda pissed, since it’s Stephen’s birthday and the girl hadn’t mentioned anything when I called, but we managed to kill fifteen minutes without too much difficulty. Came back at 8 and were seated right away, a cozy table in the corner. The only problem—and it turned out to be a huge problem— was that the party showed no sign of breaking up. We were the only diners in the restaurant, and everywhere we looked there were large groups of people standing, flirting, and sitting over drinks. AND THEY WERE ALL TALKING really loud. Either that or the architects of the space had zero acoustical insight. Seriously, the noise level was so high that the waitress couldn’t hear Stephen when he placed his drink order. Before we even read the menu, we were already talking about where else to go. The Lower East Side is packed with restaurants these days, so it’s not like we were without options, but neither of us wanted to take a chance on stumbling into another scene like this—it made us feel old and out of it and I’m pretty sure we’re neither of those things. 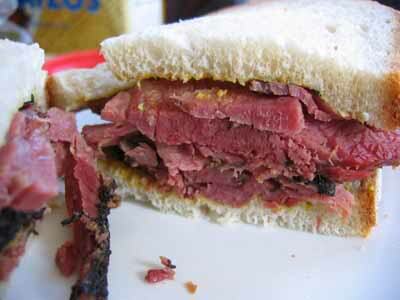 In the end we returned to an old reliable: Katz’s Deli, on Houston Street at First Avenue. It’s bustling—loud, but in a good way—and fluorescent-lit and it smells like grease and well-done food, but oh.my.god the pastrami… We went to Katz’s a few years ago on a date—it’s one of Stephen’s favorite places—but for obvious reasons (see first paragraph re: cholesterol & diet) we haven’t been in ages. Two pastrami sandwiches, one sour pickle, one square potato knish (they were out of kasha), and two diet Dr. Brown’s cherry sodas later, and we were a happy pair, chatting with the sanitation worker at the table next to us (his turkey sandwich looked so good, and his pickled tomato reminded me I’d forgotten to get one). It was about as far from Salt Bar as you could get, but we’d only walked five blocks. After half a sandwich each we were both full, so today I picked up some fresh rye bread, re-steamed the leftover pastrami, and we re-lived Stephen’s birthday dinner for lunch. As for Stephen’s yen for Beef Wellington, we’ve agreed to return to Salt Bar, early on a weeknight, and hope for a better result.